The Bees defy the odds to reach the Conti Cup quarter finals. 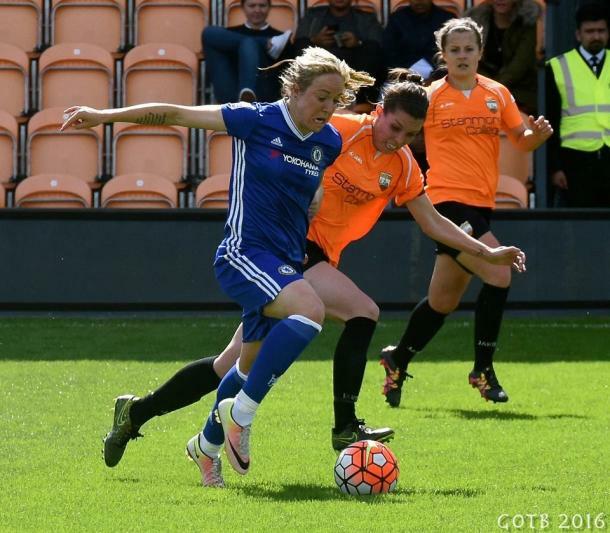 London Bees: Davies, Fogarty, Watts, Anderson (Will, min. 98), Naprta, Goddard (c), Cooper, Popadinova, Beckett, Wilson (Hinchcliffe, min. 85), Howells. Chelsea: Kitching, Blundell (Ji, min. 58), Flaherty (c), Fahey, Davison, Carney, Aluko (Bright, min. 76), England, Spence, Bailey, Russo (Borges, min. 58). SCORE: 0-1, min. 8, England. 1-1, min. 58, Flaherty OG. 2-1, min. 80, Wilson. 2-2, min. 90+2, Bright. 2-3, min. 94, England. 3-3, min. 114, Cooper. REFEREE: Paul Forrester booked Fahey (red) (min. 75), Spence (min. 118), Popadinova (min. 119). 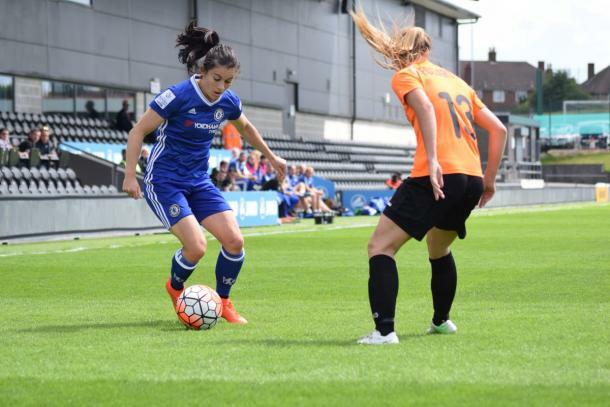 The London Bees pulled off the shock of the weekend when they held Chelsea through regular and extra time, before rounding off a superb two hours by winning the shoot-out to send Chelsea crashing out of the Continental Tyres Cup at the first hurdle. A match of the season contender. The Bees started with good intent but were quickly pinned back by the attacking mite of Chelsea. Emma Hayes had opted to start seven first-team regulars and eight of the 14 to feature in their last match – a comprehensive 5-0 win over WSL 1 strugglers, Sunderland – three days prior. Understandably the Bees looked to be struggling in the early exchanges, Sophie Fogarty tied in knots by a lively Hannah Blundell and Rebecca Anderson gifting the Chelsea full-back on the edge of the box. Dave Edmondson could have at least been happy enough that Chelsea were being forced to shoot from outside the area but the first goal of the game came from 25-yards out. Beth England unleashed a thunderbolt past a helpless Bethan Davies inside of ten minutes and it seemed like it would be a very long afternoon for the hosts. Looking at the hosts, there were problems, they were forced to play narrow, Chelsea exploiting the width and penning their opponents back. Paula Howells looked to break early, but her cross was sent into a box devoid of an orange shirt, when she was back sprinting off down the left flank, her cross was grabbed by debutant Fran Kitching before Jo Wilson could arrive to head home. The hosts had found the feet in the game and although they were camped in their own half they refused to let Chelsea work the ball into the box, Emma Beckett and Ashleigh Goddard with some meaty challenges in front of their own box to break up play. A goal down but the Bees hadn’t let their heads drop, defending as a team, keeping the Blues at bay and enjoying the odd counter attack. Davies was on hand twenty minutes in to tip a ferocious Blundell effort over the bar but suddenly the game was stretching. Eva Popadinova tore up the ground on the right to slide past any player in blue to get her cross into the box, Nikki Watts skewed her volley just wide of the far post. Fifteen minutes until the break and everything was all Chelsea, one corner led to another and another, the hosts unable to clear the ball. Wave after wave, the Bees drowning in a Blue sea in front of their box; a shot, a block, shot, block, shot, block. Relief finally coming for the home side after Karen Carney whipped a cross to the back-post and a rising Blundell couldn’t make a connection. With room to breathe the Bees were back on the attack, but Chelsea piled back with ease, no space to work, just blue shirts, and wall that the hosts didn’t know how to get through or around and it wasn’t long before the Blues were pushing the Bees back. But still the home team counterattacked, Howells once again so bright on the left, finding Wilson with a neat through ball, the attacker took one touch too many and found herself at a tight angle, Kitching limiting her options, her eventual shot was a poor one. Carney did her best to find some space, cut in and then unleashed a low shot that Davies gathered without too much hassle. Suddenly it was half-time and the Bees had made it all the way through the first-half, an early Beth England goal hadn’t been the key to unlock the floodgates and the hosts were well in the match. Chelsea clearly had the upper hand, after all they had lead by the same scoreline when they hosted Aston Villa earlier in the year in an FA Cup match, the WSL 2 side bucked under pressure in the second-half and the Blues comfortably won 6-0. Chelsea started the second-half with purpose, Eni Aluko determined to get on the scoresheet, working and working to find space to get her shot away. The Bees were shepherded into her own half once more but once again they weathered the storm, and started to work back up the pitch. “Man on, MAN ON!” was the cry from those in orange throughout the match, Chelsea closing down and getting tight, ready to reclaim the ball and relaunch their onslaught but the Bees were having more joy wriggling away from their markers. Ten minutes of the second-half played and the hosts seemed to be growing, standing taller, Howells tried a volley from outside the box that flew just wide of the top corner. But again the Bees came, countering with pace, Popadinova breaking free down the right and switching play to Howells on the opposite wing, her lay-off well weighted for Wilson to pick up. Wilson had been running tirelessly all game, always willing to chase the ball, split the centre-back and hound Kitching. She latched onto the ball as the young Chelsea 'keeper came out, her finish was rushed and poor, Kitching big to make the save but only able to parry, the ball cannoned off of Gilly Flaherty’s shin and bounced goalwards finally coming to a stop and resting in the bottom of the net. Nearly an hour had been played, the scores were equal and the hosts had thoroughly deserved their equaliser. Hayes responded immediately by replacing Blundell and England youth international and debutant Alessia Russo with Ji So Yun and Anna Borges. Both substitutes having scored against the Bees in a previous Conti Cup clash. With their tails up the Bees launched another counter attack, Wilson once again pressing the Chelsea backline, her shot just saved off of the line by a retreating Flaherty. 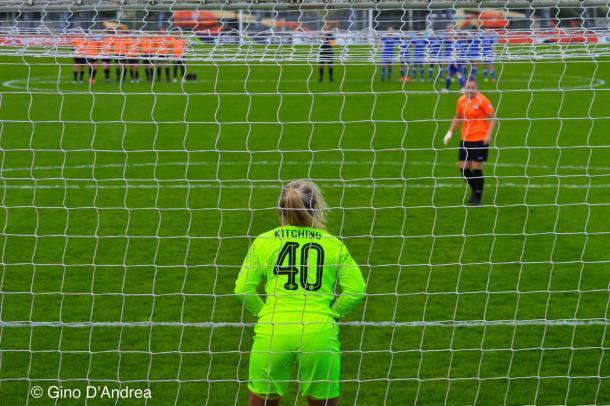 From one end to the other as Davies made a fantastic save to deny Gemma Davison, the 'keeper left in a heap and needing treatment as both teams hurried to the dugout to take on much needed water. Once more Chelsea began to push the Bees back, Flaherty wriggling free at the back-post to head a corner wide, then a counter and then Chelsea back with it. Kitching saved a loww effort from Watts before Davison fired over at the other end. One counter to another, Wilson chasing after a smart ball over the top, did her best to shrug off Niamh Fahey as she chased through the middle, the Chelsea defender cynically dragging her to the ground when she was through on goal. As the last man there was no doubt as to the colour of the card, Fahey dismissed and the Bees had a direct free kick just in front for the D. Watts unleashed the dead-ball, it flew over the wall and looped against the bar, rebounding into the box, Jade Bailey first to it to hook clear. Hayes used her last change to replace Aluko with Millie Bright, the former Belle slotting into Fahey’s vacant spot in Chelsea’s back three. The man advantage only spurred the Bees on, Anderson tried her arm from distance but her shot flew harmlessly over the bar, still the Bees attacked, Jo Wilson battling away in attack, strong to come away with the ball. Bearing down on goal, the striker was too strong for Kitching to deal with, but Flaherty once again raced back to stop the listing ball, sliding into goal and clearing the ball Deanna Cooper ready to mop up the scraps but the linesman was already flagging for the goal. The ball had crossed and for the first time the hosts lead. Ten minutes left on the clock and Chelsea started ramping the pressure back up, Davison’s free kick looping over the crossbar. Edmondson with his first change of the match, Sydney Hinchcliffe brought on to replace Wilson as the clock was ticking down and it was about seeing it out. Chelsea pressed and pressed, Kitching hovering around the half-way line with everyone back. A tussle between Davison and Cooper resulted in a corner, although it looked like the last touch came off of the player in blue. Two minutes into stoppage time and the corner was sent into the box, bouncing between players, shouts of handball fell on deaf ears before Bright fired past Davies to pull the scores level. No one in the Hive could believe it, four goals equally shared and the game was going to extra time. A few minutes for players to catch their breath and have something to drink as the sun beat down on the pristine pitch. Bright’s last gasp equaliser a sucker punch to the hosts, heads low as they kicked off for the first period of extra time. Chelsea with their heads up, once again flying out of the blocks and pushing their opposition back, the ball was whipped in towards the back post and once again England was there to head home. Four minutes played and the Blues had the upper hand once more. Again the Bees began to settle, dusting themselves off and countering against the away side. Howells drew a save from Kitching after she launched the ball at go from outside the box after being found by Hinchcliffe. Some confusion followed a minute later before the Bees were awarded an indirect free kick, Beckett delivered the ball over the wall and over the bar. Another change followed for the hosts, Anderson was spent and replaced by Merrick Will. Chelsea had another chance, as Borges forced a save from Davies at her near post. Another contentious moment followed as it appeared that Kitching had grabbed at Popadinova’s legs as she tried to round the 'keeper, both sprawled on the pitch but the referee waved play on. The whistle blown once more, another half-time. More running repairs to the players, the Blues fifteen minutes away from a spot in the next round, the Bees with fifteen minutes to find another equaliser. Chelsea were more than happy to slow the game down for the last quarter of an hour, the three centre-backs knocking the ball around, keeping their opposition at bay, the clock ticking down. But the hosts were done just yet, as tenacious play from Popadinova won a corner, the ball dropped to Beckett but her header wide of the post. Beckett then won her team a free kick by the half-way line after a cynical foul from Davison. The ball delivered and half cleared by still the Bees pushed on, digging deep. Howells sent a dangerous cross in from the right, the ball curling across the face of goal, glancing the bar, Kitching unable to make the save, a crush of bodies going for the ball and Cooper the first to it to poke it over the line. The Hive rocked, Bees, Arsenal and Reading fans all behind the WSL 2 team defying the odds, Chelsea fans (and team) shocked once again. Once more Chelsea pushed forward, the Bees stood tall refusing them a clear opportunity, time ticked down, the Bees still countering, Drew Spence went in the book for a cynical foul on the half-way line. Watts snatching at her shot, could only find the side-netting. Neither team headed for the corners, both still going hammer and tong at each other. Popadinova in the book on the far side of the pitch as Chelsea tried to counter, then the ball back with the Bees, seconds left on the clock. Howells still running, her cross field ball found Popadinova, the Bulgarian international volleyed her shot over the bar. Two long hours had been played, the sun still high in the sky and the match had to be settled from the spot. The two sides gathered on the half-way line as fans in the stands bit their nails down to nothing, all eyes trained on the far goal. Emma Beckett went first, the midfielder had been a rock all game, she sent the ball towards the bottom left corner and Kitching went with it, gratefully punching clear. Gemma Davison was the first to step up for the Blues, the experienced attacker hammering the ball into the bottom left corner. Advantage, Chelsea. Nikki Watts was next up for the hosts, pressure on and her penalty was calmly dispatched into the bottom right. Karen Carney next over the ball, having already taken two inch perfect penalties this year – one for Chelsea and one for England – you’d have put you house on her scoring but the shot was poor, just left of centre and Davies made the save. All square again. Ashleigh Goddard with the captain’s armband hugging her left arm stepped up, another ball aimed at the bottom right corner and another finding the back of the net. Ji So Yun had scored twice when the sides met in the same competition two years previously and she was the next in line, the Korean international sent the ball low to the left but too far, all eyes in the Hive watched it roll past the post and settle against the advertising boards behind. Advantage, Bees. Deanna Cooper who had scored the last goal of the game was up next for the hosts, having seen Ji send her shot wide of the left post, she made no mistake and paced the ball inside of the upright. Another captain over the ball, Gilly Flaherty had scored an own goal, cleared a shot off of the line and come close for her side from a corner already. The defender made no mistakes, hitting the ball in the same spot as Davison, pure power forcing the ball to fly up the inside of the net, her job done. The freshest pair of legs on the pitch belonged to Merrick Will, which may explain why the midfielder jogged over to the spot from the half-way line. Will had grabbed a late equaliser in the Bees’ last game, striking the ball past Sarah Quantrill in a league game just three days previous. If she scored the Bees were through, if she missed Chelsea had to score to take the penalties to sudden death. If there was any pressure on the midfielder’s shoulders she didn’t show it as she sent the ball to the right, the Hive erupting as the net rippled. Orange shirtsing forward, running at their team mates, the unlikeliest of victories. A better game you will not see. The cost of tickets for the double-header was £4, four pounds for two matches. When Chelsea played the Bees in 2014, they won 13-0, when the two sides met at the end of August last year Chelsea won 8-0. Before kick-off the odds on a Bees win were 50/1, a draw priced at 25/1 but even those seemed like short odds. Maybe 2016 really is the year of the underdog, the win was deserved. There had been plenty of shaky moments for the home side, they still struggle to settle right into a game, or even settle after a half-time break but when they found their footing they were magnificent. The squad is a new one, only three players who started this match played in either of their other meets with Chelsea (Anderson and Howells featured in both and Goddard started the 2015 tie). Their manager, Dave Edmondson is also a new face at the Hive and he has been building his squad since joining, players adapting to his style of play, a healthy number picked from WPL teams. But they had a plan and it was executed to perfection, every player huge individually and constantly working and fighting as a team. Everyone well worthy of praise. When VAVEL spoke to Emma Beckett after their draw with Durham, she said that the team don’t fear anyone and after their performance against Chelsea it’s clear that not only do they not fear anyone but their self-belief is huge. As delighted as Edmondson will be, Hayes won’t be a happy manager. Although she didn’t put out her strongest XI, she fielded an attacking team with plenty of experience and intent. Everyone (except the Bees) were expecting the Blues to kick on, the floodgates sure to open any minute, but it just didn’t happen. Aluko, Carney, Davison, Ji, Borges, Russo, were all stifled by the firm defence, although they had chances very few were clear cut. England netted a brace but she too had few chances, she just took them. The good news for Chelsea is that they can now fully focus on the WSL and retaining their title (as well as making themselves competitive for the UWCL later in the year), they still boast one of the most intimidating attacks in the league and a mean defence. The match had a bit of everything, it was high-intensity, end-to-end at times, goals from outside the box, tap-ins, an own goal, a red card, late drama, extra time, more drama, a shoot-out and more than a handful of magic. A breathless and gasping two and a half hours under the sun.